An award-winning author's stirring quest to find and understand an elusive and exceptionally rare species in the heart of Southeast Asia's jungles. In 1992, in a remote mountain range, a team of scientists discovered the remains of an unusual animal with beautiful long horns. It turned out to be a living species new to western science -- a saola, the first large land mammal discovered in 50 years. Rare then and rarer now, no westerner had glimpsed a live saola in the wild before Pulitzer Prize finalist and nature writer William deBuys and conservation biologist William Robichaud set off to search for it in the wilds of central Laos. The team endured a punishing trek, up and down whitewater rivers and through mountainous terrain ribboned with the snare lines of armed poachers. William deBuys accompanies conservation biologist William Robichaud on his quest to find the saola. The saola are one the rarest mammals in the world and make their home in very remote areas of Laos. The group endures a dangerous trek though rivers and mountains as they make their way to the presumed location of the saola. This was a challenging read for me and took a couple tries to really get into it. Once I got into the groove of reading however, I was hooked. The maps and photographs helped with really getting a feel for what the environment was like and how difficult the terrain was to navigate. William deBuys provides a real and captivating account of the expedition and builds a sense of mystery surrounding the saola. He describes the relationships he has built with the expedition members and the strong bond he has built with Robichaud. The Last Unicorn is scheduled for release on March 10 2015. I would recommend this book to anyone who wants a glimpse into a remote and uninhabited part of the world and learn about one of its rarest creatures. 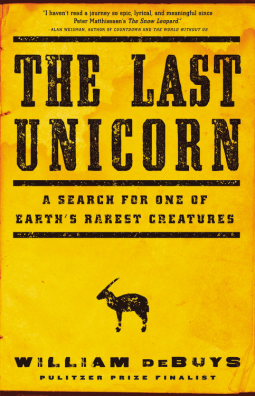 Disclaimer: I received a digital ARC of The Last Unicorn directly from the publisher Little, Brown and Company in exchange for an honest review.